Many frequent visitors called this island “Paradise”, and that’s the island located at the southernmost part of Japan, Haterumajima Island. To go to Haterumajima Island, you need to first take a 1 hour plane ride to Ishigakijima Island from Naha Airport, and then another 1 hour with the fast ferry (there’s an airport in Haterumajima Island, but it is not currently in use). Access to the island is not convenient, and the circumference of the island is only 15 kilometers. A very small island, but you will understand why it’s called the “Paradise” once you get off the ferry at the port. The first place you need to stop by is the “Nishi Beach” located at the northwestern part of the island. Very close from the port, the white sandy beach is about 1 kilometer long. Words cannot express the scene of the shallow beach off the shore that shines in emerald green. 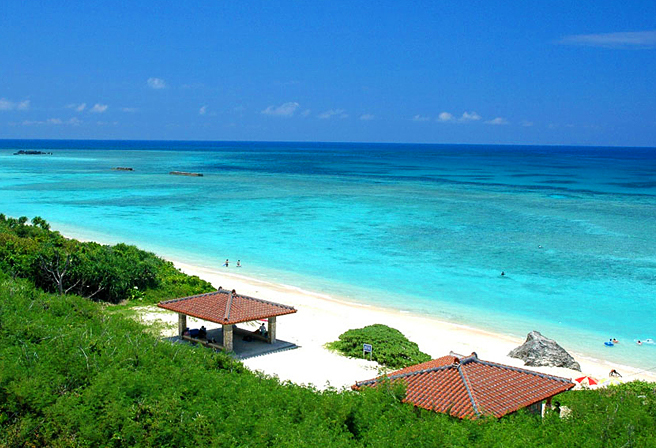 There are many beautiful beaches in Okinawa, but this beach may be one of the top beautiful beaches. The name Hateruma comes from 2 words: “Ha-te” which means extremity and “Uruma” which means Ryukyu. But the name of this island holds another meaning, which is “the island closest to the sky”. The population of the island is about 500 people. There is very little artificial light from the ground, and the island does not get affected by the jet stream. Astronomy maniacs called this island “the island where stars are seen well”. The astronomical observatory located at the southernmost tip of the island is a popular spot as an observation tower. You might be able to see and experience a fascinating starry sky you’ve never seen in your life before. ※The season to observe the Southern Cross is between December and June. April and May is the best season.